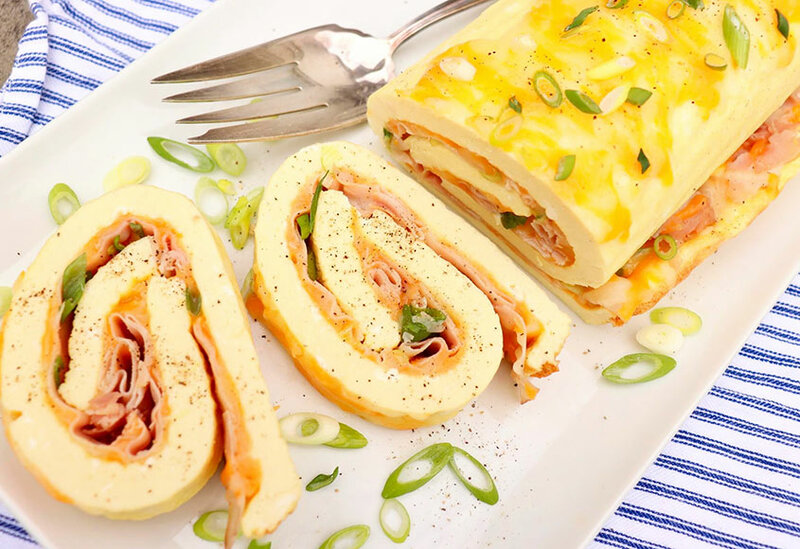 Perfect for holidays, special brunches and breakfast for dinner, this festive roll offers a fuss-free alternative to making omelets for a crowd. For added convenience, the egg mixture can be prepared well in advance. Perfect for holidays, special brunches and breakfast for dinner, this protein-rich meal is like making an omelet for a crowd. The rolled nature may suggest complexity, but do not be deterred. The method is quite simple, the ingredients are basic and much of the prep can be done in advance. Aunt Peggy (of spiced pecan fame!) was having a little consternation about what to make a friend who was recovering from surgery. She wanted to deliver breakfast food, and eyeballed two recipes given to her many years ago by a co-worker. Later that day, she emailed me a photo of blueberry baked oatmeal and muffins along with a Word doc including the recipes she briefly considered. While the co-worker assured her that the recipes were terrific, Aunt Peg just wasn’t sure. She opted for a known variable (the baked oatmeal) but wondered if I might be interested in testing these recipes that she’d saved for upwards of 10 years. I’d do just about anything for my Aunt Peggy; I was up for the challenge. Truth be told, one of the recipes, a “cottage cheese roast,” did appear questionable. The other, a sort of baked omelet for a crowd that included a fancy presentation, seemed to have potential. When I finished my first test run on the omelet roll, I packaged some of it, grabbed my earphones (remember the podcast mention on the Favorite Things post?) and set out for a destination walk. Happily, my aunt and uncle live nearby. Aunt Peggy gave the recipe, which I’ve adjusted in small ways from the original, much praise and was kicking herself for having sat on such a gem all these years. Parchment paper makes for easy cleanup and helps guide the baked eggs as you roll. Delightful on its own with a side of fruit or toast (or a green vegetable if served for dinner), we decided that a thick slice would make a great egg sandwich. Avocado slices complement nicely. My aunt agreed and offered up a dollop of salsa, too. 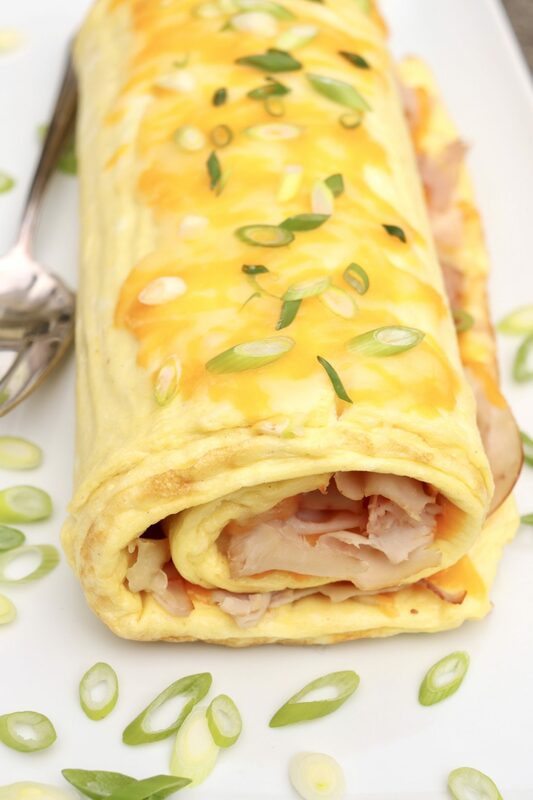 Since that initial test run, my family has enjoyed the omelet roll for breakfast and dinner. Leftovers are delightful in that aforementioned sandwich any time of day. For me, the inherent versatility adds to the convenience and overall appeal of the recipe. When you first take the eggs out of the oven, they will be puffed up and you’ll likely wonder how you’ll manage to roll them. Rest assured, they will deflate enough to make this job easy. The first time I made this, I inadvertently mixed in the Dijon (instead of spreading it over the cooked eggs as the original recipe stated), but I thought it flavored the eggs nicely so have continued to do so. Feel free to spread it over the cooked eggs before adding the cheese and ham, if preferred. I also reduced the amount of cheese and found I can get more flavor with less ham by using thinly sliced or chipped deli ham instead of cubed as called for in the original recipe. Visually and texturally, the cubes jump out at you, while very thin slices of ham integrate easily and more effectively enhance the overall flavor of the roll. The recipe is visually appealing and convenient for entertaining. The egg mixture can be prepared in advance and the roll is delicious served hot or at room temperature. If you’re feeling adventurous, you could experiment with a flavored savory cream cheese－onion and chive, perhaps? 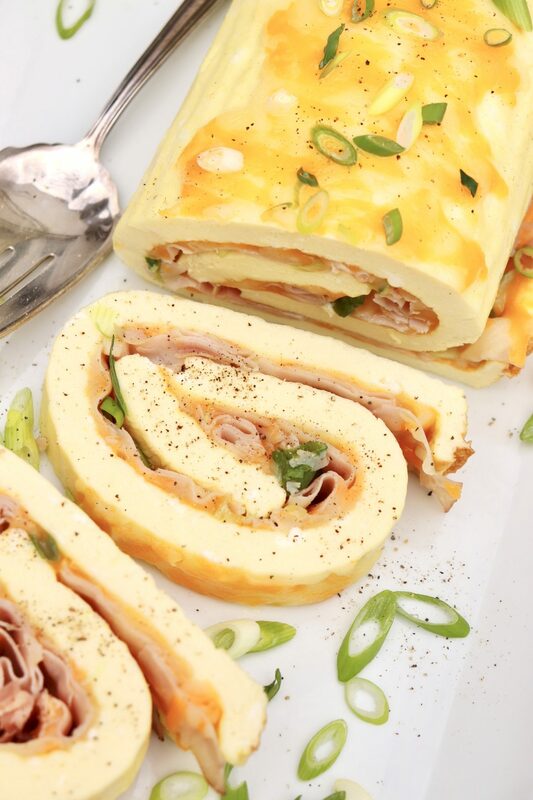 Perfect for holidays, special brunches and breakfast for dinner, this festive roll offers a fuss-free alternative to making omelets for a crowd. Pour into the prepared pan, and bake for 20 minutes, or until the eggs are puffed and just set. Remove from the oven. 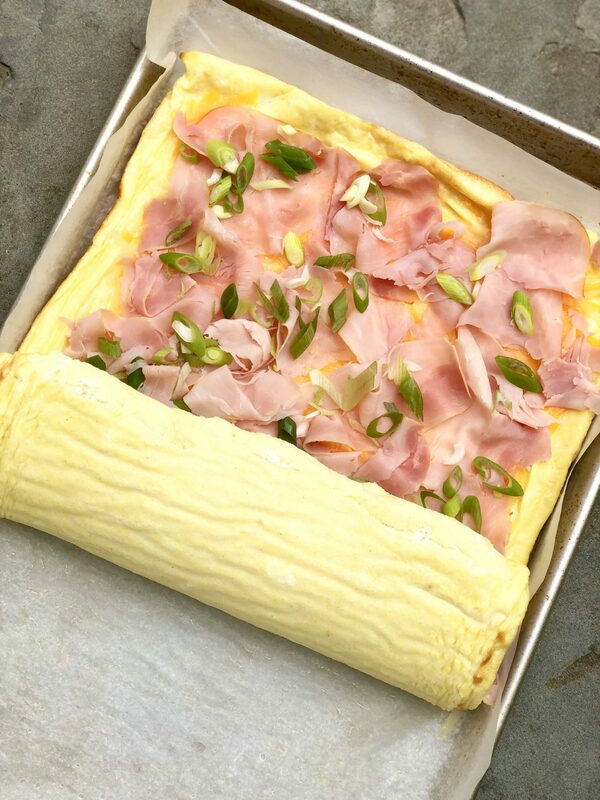 Sprinkle with 1½ cups of the cheese, and then lay the ham evenly over the surface and sprinkle with the green onions. Using the parchment as an aid, roll up the short side, peeling the paper away while rolling. Sprinkle top of the roll with the remaining cheese, and bake for 3-4 minutes or until the cheese is melted. Sprinkle with some sliced green onions, if desired, and then slice and enjoy. The roll may be served warm or room temperature. •The size of the pan is important in order for the cooked eggs to be the right thickness, width and length to roll. Measure to be sure. If using with a different size pan, note that cooking time may go up or down and a smaller egg layer will be more difficult to roll. 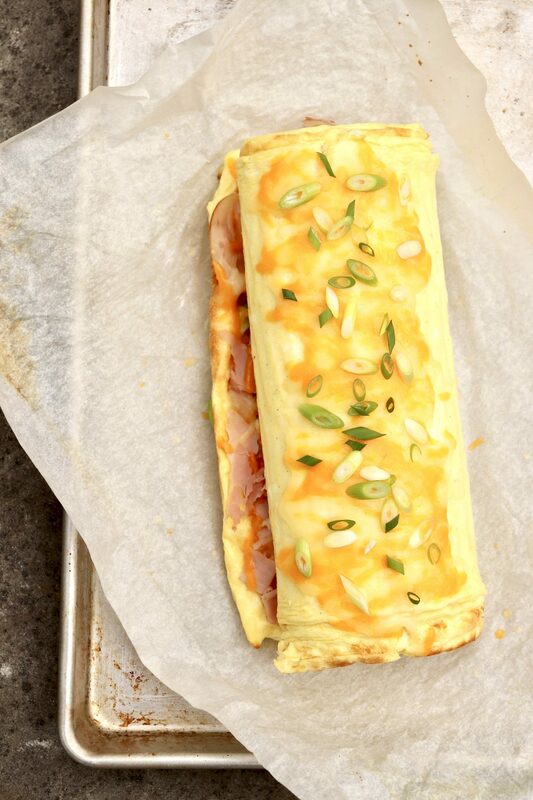 •Don’t omit the flour (although a gluten-free substitute may be used) as the small amount helps make the baked egg layer slightly more pliable. •That said, the roll might crack in places as you’re rolling. Do not worry. Just keep rolling. Small cracks where the eggs are more tightly rolled are inevitable and will be hidden as you continue to roll. Confused by all the different types of baking sheets? This will be our Easter morning brunch. YUM! We had this for breakfast on Easter morning. Very good and something different. I am thinking the baked egg mixture could also be used for breakfast sandwiches by cutting rounds with a biscuit cutter. The rounds could be used in roll or biscuit of choice with or without bacon or sausage. The rounds could also act as the bun for a sausage patty.